The Sportswriter, by Richard Ford: Before he wrote 1995's Pulitzer Prize Winning Novel Independence Day Richard Ford made his name with The Sportswriter, the first novel featuring Frank Bascombe as the protagonist. The Sportswriter is set during an Easter weekend where Bascombe is about to go through a major life change. He's already divorced, his son Ralph had died, and he feels like he is at the end of his career as a sportswriter. Bascombe is just floating aimless and while he acknowledges his flaws (many), he does not seem to take responsibility for them. Not really. From reading The Sportswriter (and one of his earlier novels, the awful The Ultimate Good Luck), I have no idea how Ford later crafted Independence Day. Bascombe narrates each novel, but in The Sportswriter Ford has Bascombe explain everything in detail. Ford, through Bascombe, tells the reader everything but doesn't show. He narrates what happened in the past rather than let details show up as part of a story. The first hundred pages, in particular, were rather difficult to sit through as Ford info-dumps on the reader. While The Sportswriter was much, much better than The Ultimate Good Luck, it was very disappointing compared to Independence Day. It felt like I was reading dictation rather than a novel written by a Pulitzer prize winning author. The Astonishing X-Men: Torn, by Joss Whedon: So we follow a Pulitzer prize winning author with a trade paperback collection of X-Men comics. I generally do not read comics, but Joss Whedon's name as writer is enough to get me reading. This is the continuation of the story told in Gifted and Dangerous. The X-Men are about to face an attack from the Hellfire Club after withstanding SHIELD and, I believe, that whole mutant cure storyline, and somehow the story felt cut off. I know it is only a handful of issues, but the main storyline felt a little short. Shorter, anyway, than Gifted or Dangerous did. Again, disappointed. Not much to say about comics, though. The Naked God: Flight, by Peter F. Hamilton: If Peter Hamilton's Night's Dawn Trilogy can be called anything, it isn’t short. Flight is only the first half of the hardcover of The Naked God and it still weighs in at just under 800 pages. I can say without a doubt that I have no idea where Hamilton is going with this trilogy, but I’m enjoying the ride. The dead souls of humanity come back to take over the bodies of the living in this science fiction spare opera and humans must find a way to save their future since killing the hosts just creates more souls trying to return from the beyond. This is a big, sprawling story and giving any sort of plot synopsis will be meaningless if one hasn’t read the first two volumes (The Reality Dysfunction and The Neutronium Alchemist). Considering there are likely more than 3000 pages across all three books (each split into two volumes for paperback release), Night's Dawn is still worth the time spent reading. Hopefully with Faith Hamilton will deliver a satisfying conclusion. I don't understand. I think the story, such as it is, is attempting tell some sort of history and future history of computing. Or, not necessarily computing but Artificial Intelligence. I guess in theory this is an interesting concept, especially as De Vries delves a little bit deeper into a future history where AI's reshape the solar system into a more powerful computing program, but as a story, as something to read...no thank you. It may or may not be well constructed, I don't know. Maybe Qubit Conflicts is a bit meta for me. The bottom line is that this isn’t something I would wish to read more of and De Vries did not leave me wanting more by the end of the "story". John Scalzi wonders why he is not running into much discussion on the Hugo Awards for Best Novel (or the Campbell for Best New Writer). For my part it is simply because I have read a grand total of one (1) of the nominees. That being His Majesty's Dragon by Naomi Novik. So...what about the other four? Well, I have every intention of reading Glasshouse as I'm rather enjoying the work of Charles Stross these days (having gotten over the whole disappointment of The Merchant Princes, which has been hit or miss but easy and moderately fun reading). I legally downloaded Blindsight from the website of Peter Watts (see above link for Blindsight) and so there is no good reason why I haven't read it yet. Eifelheim? Huh? What's that? Flynn is the author of another Hugo nominee, a moderately forgettable Novellette. It didn't really sell me on the author, but I had never heard of Flynn or Eifelheim before the nominations and have heard zero (0) buzz on his work. I've at least heard of Vernor Vinge before, and some small but positive buzz on Rainbows End. I don't think I'll end up reading all of this year's nominees (maybe, but let's not hold any breath), but next year I think I'll make a point of reading the nominees as soon after the nominations are announced. That'll give me more time before the Hugos to start thinking about it. With all that said, His Majesty's Dragon is a worthy nominee. It was a whole lot of fun to read, was well written, felt like a blend of Patrick O'Brien and Anne McCaffrey and it felt right. I've got no complaints. I think Lynch (The Lies of Locke Lamora) and Naomi Novik have to be the heavyweights in this category. These are the authors with by far the most buzz and discussion about their work and from the nooks if the online world I peer into these are the names that come up. This year it has been more Lynch than Novik (Novik more at the beginning of the year), but hard to say. I have Lies coming from the library, so I'll have an opinion on that shortly. I really like the two Sanderson books I've read (Elantris and Mistborn: The Final Empire), but I don't think he'll stand up to Novik or Lynch, even without having read Lynch. This isn't a knock on Sanderson at all. Like I said, I really like his work. I eagerly await more work from Sanderson (second Mistborn book anyone? ), but that's some stiff competition. It's an honor to be nominated, Mr. Sanderson, but I don't think you'll get this one. I've seen the name Sarah Monette, but I couldn't tell you where or what she has written. Not to judge a book by its cover or anything, but Monette's novels look like they are fantasy / romance. A little bit of a turn off, though I should probably give her a shot before running away in fear. Maybe it isn't. Just looks like it. Yikes! Lawrence M. Schoen. Umm...he's the publisher of Paper Golem LLC? Honestly, if I hadn't heard of Paper Golem, I would probably have never heard of Schoen. I should be receiving the first Paper Golem book Prime Codex for review, but that doesn't address Schoen as an author. Looks like his work is up for sale at Fictionwise. Not much else to say about Schoen. With The Last Colony John Scalzi brings his loose Old Man's War trilogy to a close. This is the story of John Perry and Jane Sagan hoping to do nothing more than continue their lives on the colonial planet of Huckleberry. They have a good quiet life together. Perry is the ombudsman of Huckleberry his wife, Sagan, is the town constable. They have an adopted daughter, Zoe, and two aliens which hold Zoe in great reverence because of who her birth father was. This idyllic life is perfect for John Perry and Jane Sagan, but it would make a fairly crappy science fiction novel. A representative from the Colonial Union pays a visit to Perry and Sagan to request that they lead a new colony, this one the new colony of Roanoke. Unfortunately for Roanoke, there is a four hundred and twelve member collection of alien races called the Conclave. The Conclave has ordered that there will be no more colonies on any planet unless specified by the Conclave, and then only by Conclave member nations. If the Conclave can find Roanoke, the fledgling colony may be destroyed. With conflict within the colony as it struggles to survive, political maneuvering from the Colonial Union about the future of Roanoke, and the threat of alien destruction, there is quite a bit going on behind the scenes and the very future of humanity is at stake. There is a very real question on whether or not any human colony would ever be named Roanoke. The lost colony which existed for three years in 1500's Virginia before disappearing utterly. While a government would not necessarily be superstitious, there would be no reason to name a colony after a failed colony, so right from the start Scalzi is telling his readers something about what is going on: it isn't what we first know, and that Scalzi's Roanoke faces the same danger of disappearing as the original Roanoke did. Rather than an action filled story, like Old Man's War and The Ghost Brigades, The Last Colony is a novel about survival. There is far less action, but still The Last Colony tells a good story about the threats to Roanoke and how Perry and Sagan respond to those threats. Perhaps the largest trademark of a Scalzi novel is the wise cracking sense of humor each novel is laced with. The bottom line is that a Scalzi novel is fun to read. Pure pleasure. Scalzi novels read quickly with a sense of joy in the storytelling. Even being more of a political novel than the military action of the previous two OMW stories, The Last Colony is chock full of fast paced storytelling and with this volume, the story is closed on John Perry and Jane Sagan. The fan in me wishes that Scalzi would write more OMW stories, but the realist says that this chapter is closed and that the stories have been told. Scalzi leaves his readers wanting more, and that's a major mark in the favor of Scalzi. Scalzi is a talented storyteller and worth spending the time to read. Governor Tim Pawlenty signed a bill into law which will merge the Hennepin County and Minneapolis Public Libraries. This makes me happy simply because it means that, presumably, I won't have to request books via interlibrary loan from the Minneapolis libraries. I can just reserve them...and that opens up another range of books for me to get...unless some of those volumes not purchased by Hennepin county will not be purchased under the new system, but I'll choose to believe that I will gain from this merger. Winnowing the Herd is a Kitty Norville short story which is set before even Kitty and the Midnight Hour. This means that the reader knows that Kitty is a werewolf and a late night DJ, but nobody else does because she did not reveal herself on air quite yet. The story is set at a radio station party and the story is told through Kitty's perspective, though she is not identified until page two. It is the night before a full moon and Kitty is on edge. Everything smells stronger and she is identifying the scents of everyone and everything in the room and also identifying the other humans as prey. Perry. That was who I'd go after first. If I were going to go after anyone, which I wasn't, because I had better control than that. Perry was the receptionist/secretary/bookkeeper. Small, delicate, big eyed, slouching warily in her baggy sweater. She wrote romance novels at her desk on the sly. She'd totally freeze in the face of an attack. Easy prey. The wolf in Kitty is closer to the surface and because this story is set earlier in her life, she may not be fully comfortable in her skin as a werewolf. There is no true plotline in the sense of the plot driving the story as Winnowing the Herd is Kitty at a party and her reactions to people and scents. Winnowing the Herd is a bit of a show piece, giving a glimpse of a favorite character before the events of any of the novels. For fans of any of the Kitty Norville novels, Winnowing the Herd is a fun little story. Those who are unfamiliar with the work of Carrie Vaughn might be better off starting with Kitty and the Midnight Hour. Carrie Vaughn is the author of three Kitty Norville novels: Kitty and the Midnight Hour, Kitty Goes to Washington, and Kitty Takes a Holiday. At its core Coat is a simple story: One man sees another man wearing an extremely unfashionable coat. The man wearing the coat was also wearing clothes which were the height of the current fashion, but not the coat. The coat was unfashionable and James, the first man, hates the coat-wearing man because of it. For no better reason than this glaring lack of fashion James becomes obsessed with the coat and with the man and feels a compulsion to confront the man for wearing that unfashionable coat. In all of six pages Joe Lansdale tells a story of obsession, of a coat, of irrational emotional response, and turns this simple story of a one man hating another man for an unfashionable coat into something of a horror story by the end. With the opening of James hating the coat-wearing-man, there is no sense of where Lansdale will take the reader. With the opening of James hating the coat-wearing-man, the reader is given the steady and sure voice of Joe Lansdale and the stylized dialogue of a Lansdale character. "Not at all. Look, you seem like a nice fellow. It's one thing for someone of...well, the lower classes to wear that coat, but for you to mix fashion like that, that dreadful coat over those fine clothes, it should be a hanging offense." The man threw up his hands. "I've had enough of you. What business is it of yours?" "I spend a large part of my time designing fashion, trying to make the world and those who live in it more attractive. Take what I’m wearing for example--"
"I wouldn't take it if you gave it to me," the man said. "I'm quite comfortable with my heirloom coat, and you, sir, are a weirdo who needs to go home and run his head under the shower until it clears, or, until you drown." A Joe Lansdale story is a treat and Subterranean has delivered its third Lansdale in as many issues and collectively they show the strength and skill of Joe Lansdale. Coat is a simple, short, quirk of a story, but is deadly serious. It does not fit firmly in any genre, but is a very good story and while it is short enough to not require a time investment of any kind, it is strong enough to stick to the bones after the last (virtual) page is turned. Subterranean Online is out with the beginnings of its Summer 2007 issue. The first two issues were outstanding with quality fiction, some articles and reviews and even the entire Missile Gap novella by Charles Stross (my review). Not much is up yet in the Summer 2007 issue, but we should be seeing more stuff from Charles Stross, Gene Wolfe, Elizabeth Bear, and Charles DeLint. There is already a Joe Lansdale story up. This is an online magazine that gets me almost giddy with excitement whenever I see new content is up. Good quality stuff across the board. As I do almost every day I checked my library's website to see what new books they have coming up that I can reserve. This is why I generally have 40 books on reserve at any given time and every time I make a serious effort to work down my number of holds it grows right back up again. This morning I saw two (well, three) books I did not expect. First, Natural Ordermage by L. E. Modesitt, Jr, coming out this September. Now, last time I checked Modesitt's next novel was to be Mage-Guard of Hamor. I'm not sure what happened, but the timeline has switched. I think Mage-Guard is still forthcoming, but...huh. I'm not excited, but I'm interested because I generally enjoy Modesitt's work. 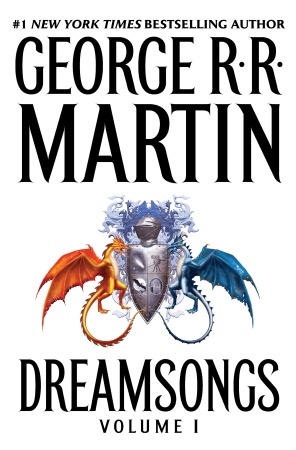 DREAMSONGS was originally published in 2003 by Subterranean Press as GRRM: A RRetrospective. The collection features half a million words of short fiction, teleplays, essays, and autobiography, along with an introduction by Gardner Dozois and a bibliographical checklist by Leslie Kay Swigart. SF, fantasy, and horror, a Twilight Zone script and my famous busted pilot Doorways, Haviland Tuf and Wild Cards, Hugo winners, Nebula winners, a Bram Stoker winner and a World Fantasy Award winner, and lots of losers too... DREAMSONGS has it all. I've been looking forward to reading the RRetrospective for some time now and the Subterranean edition has been hard to come by, so this one I'm excited for! Good stuff! Khaled Hosseini's second novel A Thousand Splendid Suns goes on sale today. I have such a back log of books at home right now and several more on the way from the library, but this one I must read. His first novel, The Kite Runner, was spectacular and one of those novels I just had to recommend to people even though I could not do the novel justice in describing it. Now his second novel has just been published. Can't wait to read it! Alright, so I don't think I am going to spend much time writing about Star Wars...mostly because I don't have too much to say about it except that I enjoy the books as my semi-guilty pleasure. What I will say is that I rather like this cover to the forthcoming Death Star novel by Michael Reaves and Steve Perry. Don't know much about the book except the subject (kind of a given, huh? ), but I've enjoyed the SW work of Michael Reaves thus far. The cover gives a sense of fast paced action (see the ships racing towards the Death Star) and the ultimate Star Wars menace that is the Death Star. Hopefully the novel is as good as the cover. Blowing My Cover: My Life as a CIA Spy, by Lindsay Moran: Moran's memoir of her time working as a CIA spy in Macedonia reads like a chick lit memoir of espionage. Moran is very open with her experience and her opinions on the CIA and it never feels like Moran ever truly belongs in the CIA. Her opinion is refreshing and her criticisms honest. In the Garden of Iden, by Kage Baker: This is Baker's first novel and the first novel of the Company. I especially loved the opening chapter which explained the premise of the series. Sometime in the future some scientists discovered two things: time travel and immortality. They formed what is known as the Company and send agents back in time and give those agents immortality (as well as give locals immortality in exchange for service to the Company). The way time travel works is that recorded history cannot be changed, but nonrecorded history...that can change. So, artwork that goes missing for centuries...the Company can acquire it. Investments? Yep. So, in the future the Company has untold riches and power. Love the premise. In the Garden of Iden is the story of Mendoza, a Spanish girl in the era of Henry the Eighth who is saved from the Spanish Inquisition by the Company and they make her an agent. Immortality has a price: becoming a cyborg. No longer fully human and with no expectation of death. The premise is fantastic, but once we get past the premise we are stuck with an alternative historical fiction with science fiction elements. Decent, but not amazing. I'll still read more Company novels, though, just to see what's going on. Starship: Mutiny, by Mike Resnick: This is my introduction to Mike Resnick and I loved it! Sure, Wilson Cole is something of a stock feeling science fiction character, but the story is a lot of fun to read and got me exciting for what happens next. It did have a bit of a pirate feel (which is good, considering the next novel is titled Pirate) and our hero of a hyper-competent officer who will disobey bad orders to achieve a positive result. He is given accolades but is also exiled to military posts where he will never see combat so he can cease embarrassing the top brass with his unconventional success. Cole only cares about his soldiers and about results. Naturally something will happen so that Cole once again must take command against orders and when it does, it's a hell of a story. This is an author I'm glad to have discovered and hope to devour more of his work. Balance Point, by Kathy Tyers: The sixth entry in the New Jedi Order series is a huge disappointment. The first hundred pages are tough to slog through and somehow Tyers is unable to capture the feel of the Star Wars novels and the NJO series. Sure, the NJO is a bit of a downer, but there is still a sense of movement and adventure. I did not feel any of that in Balance Point. Granted, I did not enjoy her previous Star Wars novel The Truce at Bakura, but if I wasn't reading the NJO I would probably not have finished this one. New York Magazine offers up this guide to oeuvre of novelist Don DeLillo. Ever since I read End Zone at Northwestern as part of a survey of 20th Century American Literature (thank you, Professor Fynaardt) I was sold on the work of DeLillo. Every novel I read was a revelation and when the next American Lit class Professor Fynaardt taught brought us White Noise I realized just how good Don DeLillo was. He was nothing like any other author I had encountered and I needed, not wanted, to read everything else the man has written. Some of it has been quite brilliant and outstanding, other novels were something of a mystery. I agree with much of how New York Magazine categorizes the work of DeLillo. Pafko at the Wall (the prologue of Underworld published as an individual volume) is one of the most outstanding pieces of fiction I have read and it was simply the prologue to a novel! I understand why Libra is considered a classic, but it is the only one of the four in the Classic category which did not completely knock me down. Likewise, I would knock Great Jones Street down a couple pegs and out of the Recommended category. I would probably swap GJS's place with End Zone. Very funny and an odd combination of football and nuclear war. On the other hand, I could not agree more with the To Avoid category: Cosmopolis, The Body Artist, and all three of the man's plays. Immensely disappointing. The Unread List for me: Ratner's Star (which I own), Amazons (which I do not), and the forthcoming Falling Man. DeLillo has long been a favorite and if Falling Man can deliver the goods like DeLillo's novels once delivered, I will be one happy reader. Shoot, if Cormac McCarthy and Philip Roth can get better with age, there is no reason why Don DeLillo cannot be another fine wine in the American vintage. After the events in The White Rose the Black Company was destroyed to a handful of soldiers. Croaker, once only the Annalist and medic of the Company, is now leading the Company south to find the city the Black Company originated from. There is a mandate that when the Company is disbanded they must head south and return the Annals of the Black Company to its home city, a city which none have seen in hundreds of years. Croaker takes the remnants of the Company, which now consists of Goblin, One Eye, Murgen, Otto, and now once their enemy The Lady. Croaker takes this remnant and on their way south they start finding others willing to join the Company and by the time they get to the edge of their map where nobody will tell them what is beyond, their numbers have swollen far beyond what it once was. The Company is an army and it needs to be because they now have battles in front of them which they must fight if they hope to make it to their origins. Croaker mentions midway through the novel that this trip South is a trip through the history of the Company. The Company, as it currently exists, knows nothing of these lands they are travelling through but these lands know of the Company and many of the memories are not positive. The historian in Croaker is fascinated, but somewhat scared because the Company must have been far more violent and harsh then they even are now. Shadow Games is the Fourth Chronicle of the Black Company and it is the First Book of the South. Shadow Games is a marked improvement over the White Rose. While the first three Black Company novels were collectively telling the story of the Company fighting in the North and I found them to be a revelation in fantasy and outstanding, by the time Cook hit The White Rose the storytelling lost some of that fresh feeling. The story was still excellent, but it was not going to knock anyone out, even with the twists and turns and gritty soldiers on the ground action. We had seen it all before. With Shadow Games Glen Cook brings something new to the table. The Company we knew before is gone, the focus of the Company has changed and the former enemy is a powerless ally. The fragment of the Company is traveling South through its history. Shadow Games has that fresh feeling back. The only complaint I can raise against Shadow Games is that I really want characters who die to stay dead. Cook has done this in the past couple of novels and he does it again here. I will not spoil who is not dead, but I would really love dead characters to remain so. Outside of this, Shadow Games is a fantastic restart to the Black Company. What happens next? Only one way to find out and Black Company is essential reading. Shadow Games no less so. Subterranean Online has new stories by John Scalzi and Joe Hill posted. The Scalzi is fairly lightweight and pleasant, like his previous Subterranean offering. I rather like the ending to the Joe Hill. It's a decent twist and the story is a bit of a quirk and it shows that Hill has some range since he is the heir apparent to whatever Horror crown there is out there. Lastly, I'm reading Mike Resnick's Starship: Mutiny at the moment and I'm thoroughly enjoying it. Got some decent wit and easy military SF (sort of like Scalzi, only not really). I'm interested to see where Resnick is going with this. Oh, also a hundred pages into Blowing My Cover. Totally worth it. It's one woman's experience in joining the CIA and how it is nothing like what she expected. Lindsay Moran is currently training (in the book) as a spy and it feels almost surreal. I'm surprised the CIA allowed this book to be published because it does reveal (so far) actual practices about the secretive organization. I really, really like this cover for Joe Hill's debut novel Heart Shaped Box. Just stunning. Makes the novel look dangerous, scary, and exciting. This limited edition cover from Subterranean Press beats the pants off of the more widely available one. A Thousand Deaths is the first collection of George Alec Effinger's Sandor Courane stories. Courane is one of Effinger's science fiction alter-egos, though this may be more of an impact in the shorter Courane fiction than in the opening novel The Wolves of Memory. The Wolves of Memory introduces the reader to Sandor Courane. Courane, in a future where humans have given up control of their lives to computers, is assigned three jobs for which he is entirely unsuited and he subsequently fails at each job: basketball player, science fiction writer, assembly line worker. When he fails at each Courane finds himself in violation of TECTwish (TECT being the overcomputer which everyone must obey) and is exiled to Planet D, an apparently perfect agrarian world. The problem: everyone on Planet D suffers from an illness which slowly robs the citizen of his or her memory, and eventually their lives. Told in a fragmented style where flashbacks meld with the main storyline of Sandor Courane carrying the body of his love back to the farm, The Wolves of Memory is perhaps the perfect title for this novel because there is a sense that Courane's memory is quite literally being eaten away. This is an extremely effective and moving story, one which hints at something sinister with TECT and shows the nonsense of anyone knowing what a person wants most, including the person in question. The Wolves of Memory is an exciting opening to this collection which continues with seven short stories. Unfortunately, everything that was exciting about The Wolves of Memory is lost in the other stories. In "Fatal Disk Error" TECT is only a figment of the imagination of Sandor Courane as he writes science fiction stories (and so only ties into The Wolves of Memory in a tangential way). "In the Wings" introduces Sandor as a fictional character waiting to be written into the author's novels or short stories. The other five stories have Sandor Courane as the primary character, but in situations that are simply stories with no tie into TECT or The Wolves of Memory. Obviously this is the way George Alec Effinger wanted it and in this posthumous collection Marty Halpern, the editor, placed the stories in this particular order for a reason. A Thousand Deaths brings the Sandor Courane stories of Effinger together in one place, but it is only The Wolves of Memory which really connects or leaves any sort of impression. The collection is very much worth reading for the opening novel, but the short stories are mostly miss because of the lack of continuity or tie in with the novel. Had I never read The Wolves of Memory I may very well have felt differently about the stories. Reading copy provided courtesy of Golden Gryphon Press. 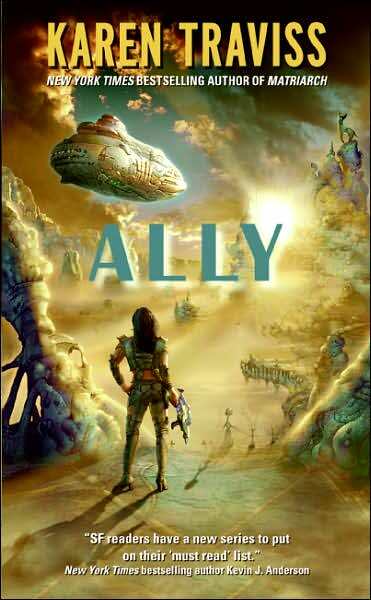 With Ally Karen Traviss delivers the fifth entry in her Wess'har Wars series. The aliens are now one step closer to Earth and the Wess'har will cleanse and rebalance life on Earth...which will result in significant loss of human life (but salvation for the other forms of life on the planet). Shan Frankland, once a police officer, a "copper" in her words, once a human much like any other, is, and has been for several books, much more than human. She identifies much more with the Wess'har and due to her infection of c'naatat Shan is nearly immortal. She can die, but even stepping out in the vacuum of space is not enough to kill. Shan's ideas about conversation and the value of the lives of non-humans fall in line with much of Wess'har. She is also married to a Wess'har, Aras, who is also infected with c'naatat and has been alive for five hundred years, and to a human soldier, Abe, who suffers the same fate. Shan knows that she cannot return to Earth ever because humanity should not have access to c'naatat. But this is only one aspect of what is going on and only identifies who Shan Frankland is. There is war on Umeh, the home planet of the isenj, and the Wess'har have been invited to restore Umeh to a natural balance, but they have not been given full permission to cleanse the planet as they would wish. So, there is conflict on the planet as some of the isenj revolt against the isenj leadership, but in that revolt they pit themselves against the Wess'har and ensure the destruction of the isenj. On Bezer'ej, the world known as Cavanaugh's Star, there is a different problem. The world is in balance and though the bezeri have been nearly exterminated by a couple of humans and a big mistake, there are still survivors and Lindsay Neville, the guilty party here, was infected with c'naatat to serve the survivors in the oceans. Lindsay wonders if that service could be to save the bezeri by infecting these creatures, once thought harmless but recently discovered as overhunters who have destroyed eco-systems, and bringing them on land. There is less a sense of discovery and raw excitement than there was in the first entries of the Wess'har Wars. This is only to be expected as Traviss is telling an ongoing story and not introducing the reader to an entirely new culture and worldview. One thing that Traviss does well to keep her novels fresh is that each novel introduces something entirely new and shattering which changes everything for the next novel. Earlier in the series it was infecting Shan with c'naatat, infecting Abe, the near destruction of the bezeri, killing Shan (which obviously didn't work), the planned invasion of Earth by the wess'har, and infecting Lindsay and Rayat. Because c'naatat is nearly impossible to eliminate (but it is possible), having more characters infected each with different views on life and what should be done with c'naatat, everything changes. All of this helps keep the series fresh and leaves the reader to end a novel with something shocking and spend the next year wondering what will happen next. So what about Ally? Well, Traviss gives us our shocking event which changes everything. Something about Ally felt far more compelling than the previous volume, Matriarch. Perhaps it is the sense that in Ally something is really happening and the overarching storyline of bringing the Wess'har to Earth may actually happen in the series. There has been a sense of stasis in recent volumes where there was a bit of a question of whether or not Traviss would actually write about the Wess'har getting to Earth. Real progress on that storyline has been made now. Add this progress to the already fascinating ethical discussions and actions of Shan, the Wess'har on Umeh, the bezeri, and the possibility of Earthly invasion and what we have is an improvement in the series and a step back to what we had in the first three novels. There is simply a greater sense that things are happening in this novel than in the previous one and this leads to greater satisfaction with the novel. Unrelated to the review: Beautiful cover. There is likely a pending review for Ally and possibly for Louisiana Breakdown (the short version: I rather enjoyed the Karen Traviss and Louisiana Breakdown is a creative work of short fantasy and worth reading, though not amazingly outstanding). If I review Survivor it will be with the bottom line being: disappointing for Butler.